U.S. Sen. Jerry Moran’s week got off to a lively start. 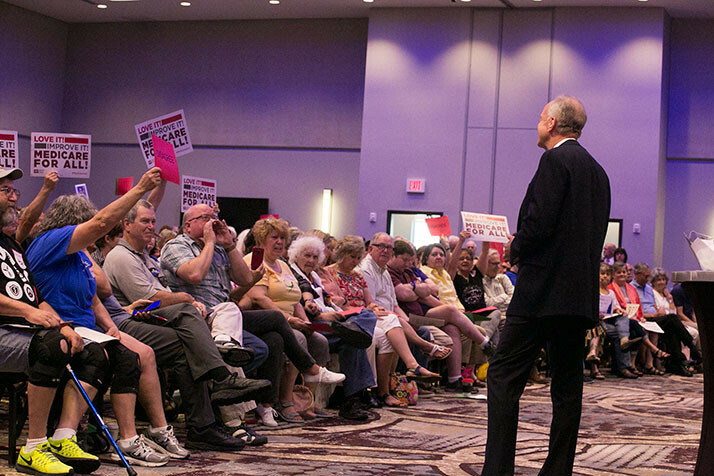 The western Kansas Republican faced a sometimes raucous crowd of more than 500 people at the Hyatt Place in Lenexa on his way to the airport to fly back to the capital Monday morning. It was his first public town hall in Johnson County since President Donald Trump came to office. Neither Sen. Pat Roberts nor Rep. Kevin Yoder have hosted in-person town hall meetings here during Trump’s tenure. The charged crowd was similar to the ones that have assembled to protest the direction of the federal government over the previous five months in other states. The group Indivisible Kansas City, which has organized demonstrations of opposition to the policies of the Trump administration and the Republican-controlled legislature, worked to turn out a large crowd for the 7:30 a.m. session. 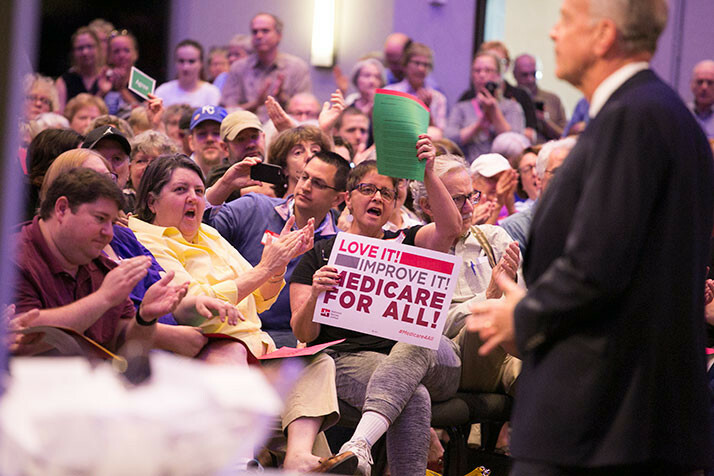 The full first half of the town hall focused on health care. Moran said he supported holding open committee hearings on any Republican health care bill before it would come up for a vote in the Senate. 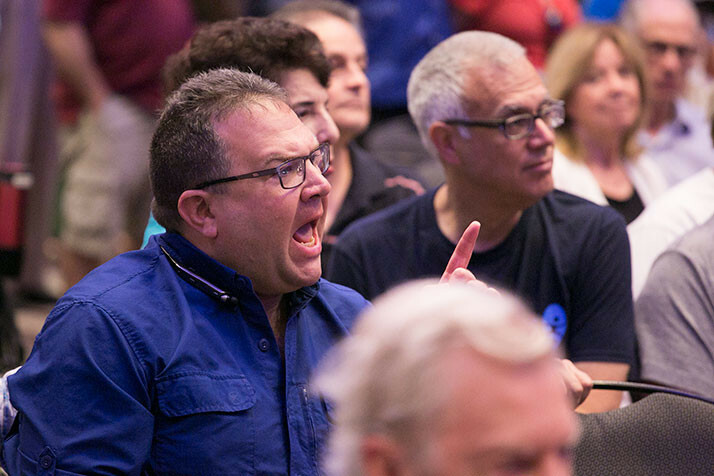 But he told the crowd he could not promise that he would withhold his vote for a health care bill if Republican committee leadership failed to hold an open hearing, an announcement that drew substantial boos from the crowd. The senator said that access to health care was as important a component as price, and that the system must be designed to keep rural facilities open. “If you live in my hometown and there’s no doctor and there’s no hospital, whatever it costs may be important, but it doesn’t give you access to health care,” he said. Moran said he had visited every hospital in Kansas, and that Kansas health care facilities had larger bad debt expenses today than before the Affordable Care Act was put into effect. The crowd responded by chanting “Brownback, Brownback,” in apparent reference to the governor’s repeated efforts to quash expansion of Medicaid, which some rural hospitals say would help their financial situation. Moran said his analysis of health care legislation will be driven by his desire to see unnecessary costs eliminated, while providing affordable access to care. 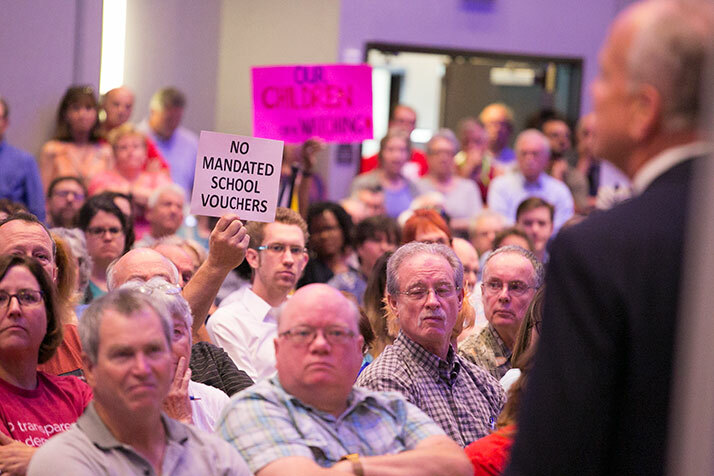 Pressed by an attendee on whether he would “buck his own party” if the bill didn’t pass his tests, he responded, “If I reach the conclusion that that’s in the best interest of Americans and Kansans.” That response prompted the longest and loudest applause of the morning. At the time of the confirmation hearing and vote on Betsy DeVos’s appointment as Secretary of Education, Moran was widely seen as a potential swing vote who could have played a part in denying her ascension to the post. He ultimately voted to confirm her, and she became Secretary of Education on a 51-50 vote with Vice President Mike Pence breaking the tie in the Senate. He also noted the strength of Johnson County’s public districts. 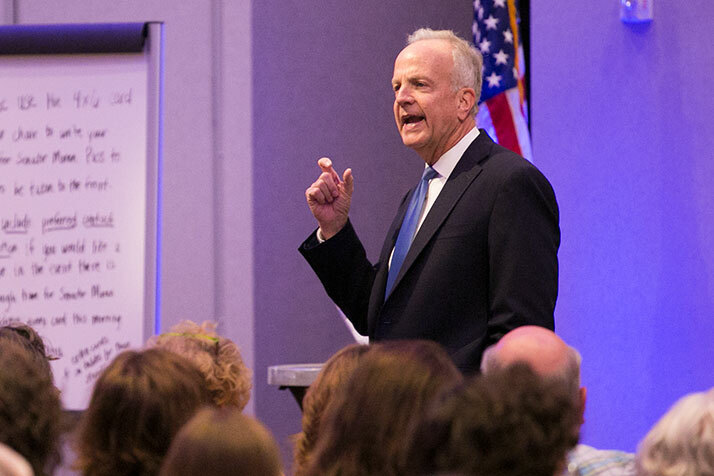 “In Johnson County, we have Shawnee Mission Blue Valley and Olathe, where throughout most of my life people have moved to Kansas because they appreciate the quality of education they receive here,” Moran said. “So would you [Ms. DeVos] promise me, would you commit to me…that you will do nothing to support federally mandated vouchers on places — local boards of education or states that don’t want vouchers?” He said she had made that commitment. A few attendees pressed Moran on his former Senate colleague Jeff Sessions and whether, given Sessions’ involvement with Russia, Moran would have voted for him again as Attorney General. “I would not do so at the moment until I know what the facts are,” Moran said. Moran said he believed that Russia had clearly worked to influence the election and that the government needed to fully investigate those interventions.